I just discovered this incredibly delicious gluten-free bread on Food 52 that was originally posted on My New Roots by Sarah Britton. 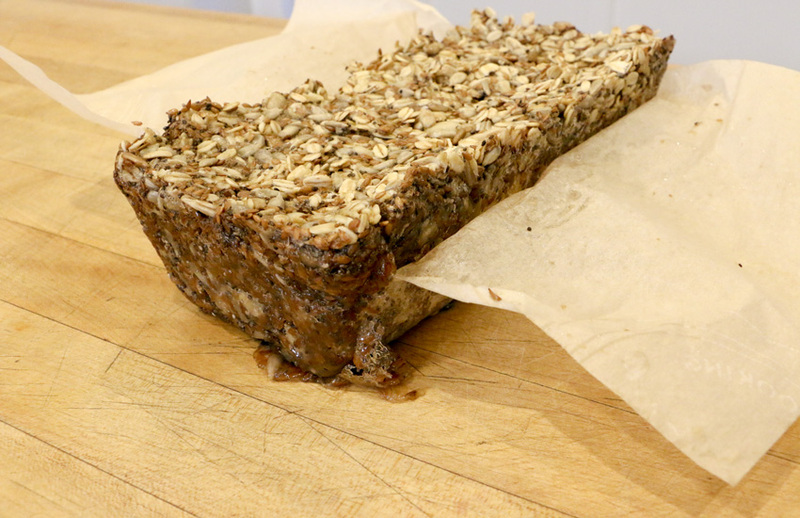 Sarah named her bread "Life-changing loaf of bread" and it is in no way an exaggeration. If you are gluten-free or gluten-reduced like I am (that means I try but cheat frequently), this bread is for you. If you are not gluten-free please don't skip over this recipe. It is truly delicious and packed with healthy ingredients. 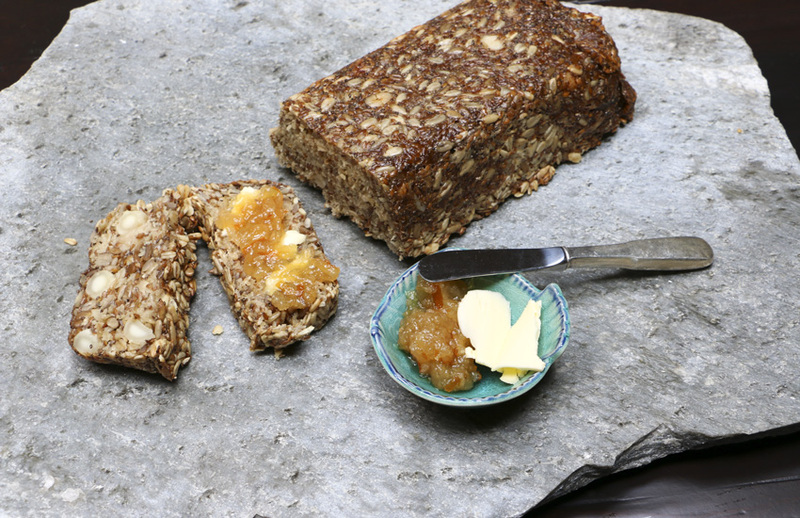 This bread is loaded with nuts, seeds and rolled oats and is held together with psyllium and chia seeds. Lots of heart-healthy, anti-inflammatory, blood sugar-regulating, appetite-controlling and pro-digestive ingredients. The process is highly irregular. You mix the ingredients in the same pan you bake it in. 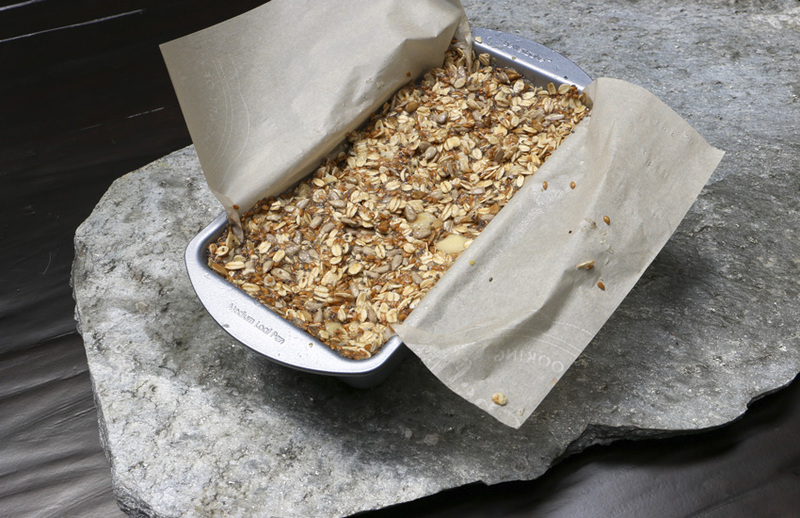 It hangs out on the counter for 2 hours to overnight before you bake it. You pull it out of the oven after 20 minutes, take it out of the pan and return it to finish baking upside-down on the oven rack. Could it get any weirder? 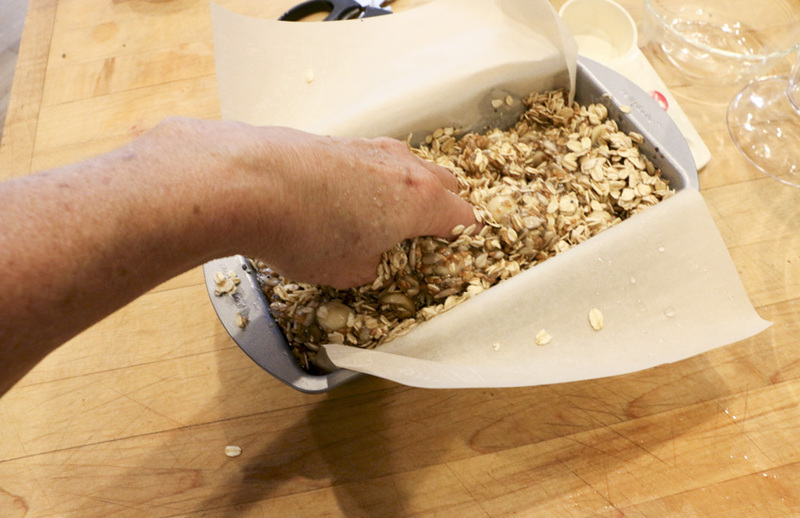 You can substitute all kinds of nuts and seeds as long as you use the same proportions. 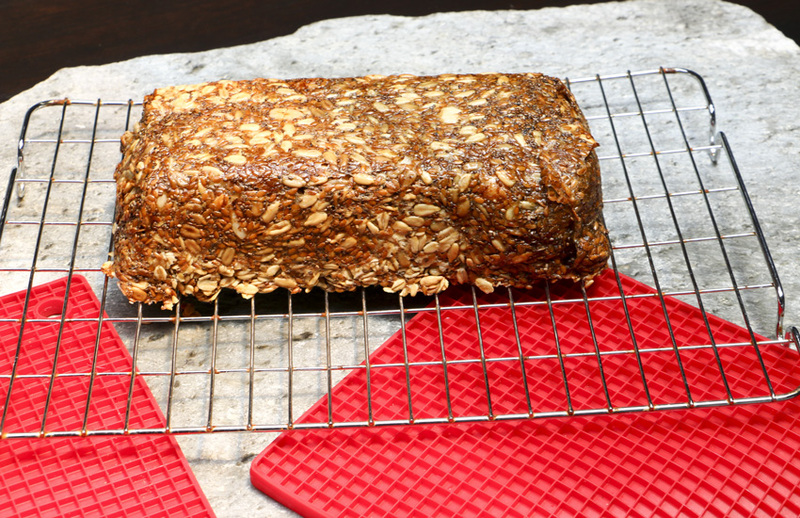 You can use quinoa instead of rolled oats, but will need to add a bit more water to the dough. As a blogger, I know that comments on a blog post are more rare than plentiful. 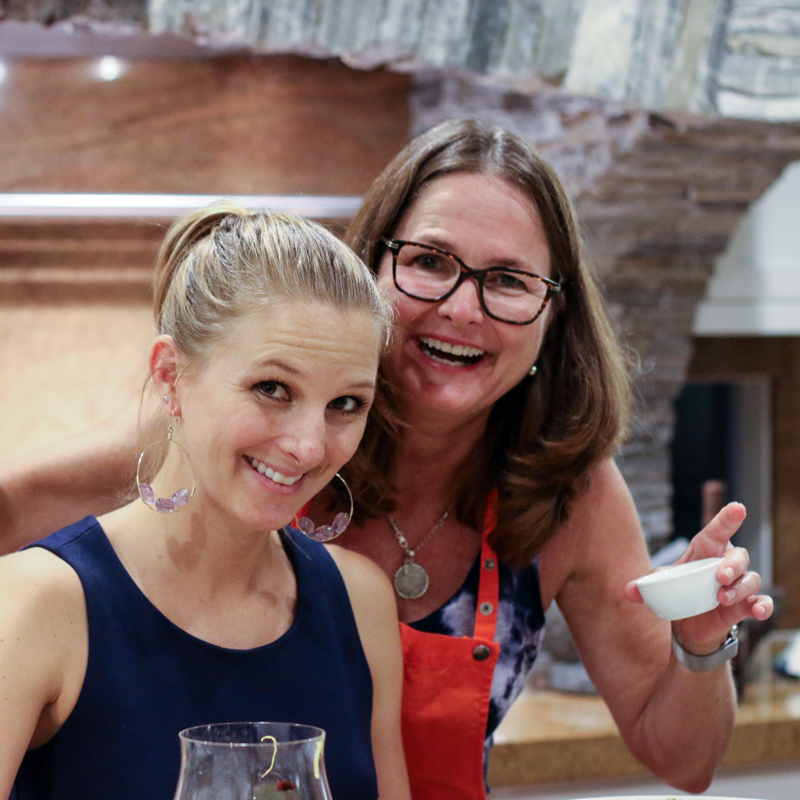 People may LOVE your recipe, but few will actually comment on it. 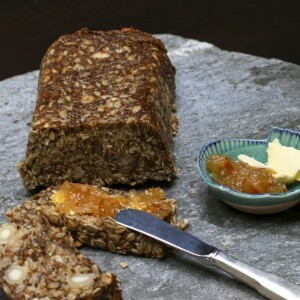 If you check out Sarah's blog you will see that there are over 1200 comments about this bread. That is extraordinary and a testimony in itself about how phenomenal this bread is. 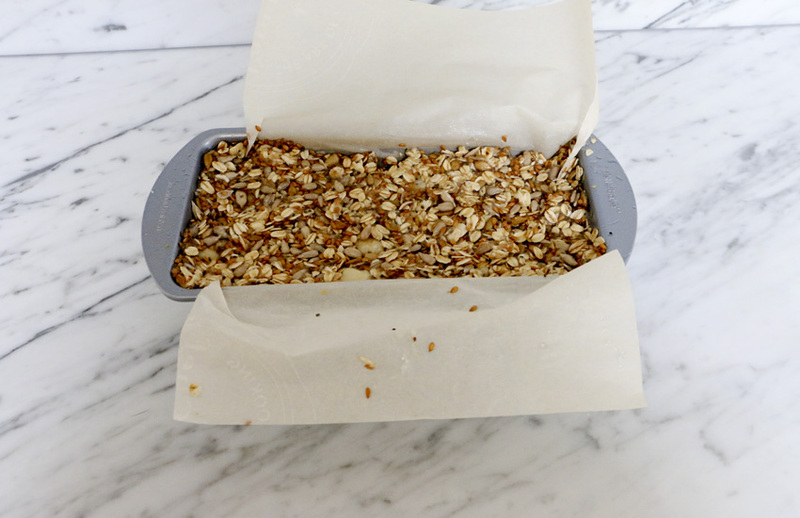 I use a standard 8.5" x 4.5" 1 pound loaf pan that I line with parchment paper. Sarah recommends a silicon loaf pan, but I thought my regular pan worked just fine. The trick is how you line the pan. 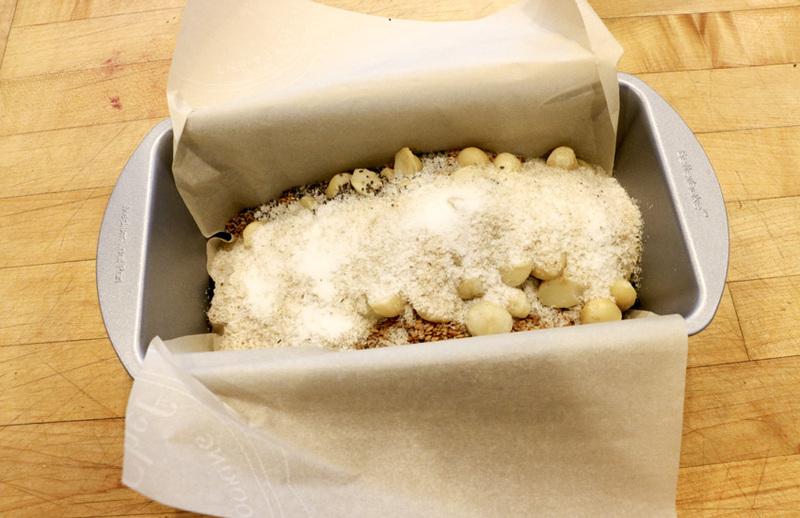 Cut the paper so it is the length of the loaf, but allow for several inches of parchment to stick out of each side. You will use this extra paper to lift the loaf from the pan. I used macadamia nuts in my first loaf and it was delicious, but there are all kinds of variation possibilities. I'm thinking of all kinds of nuts and dried fruit combinations. Maybe adding some black strap molasses or a mashed banana or shredded zucchini or carrot? 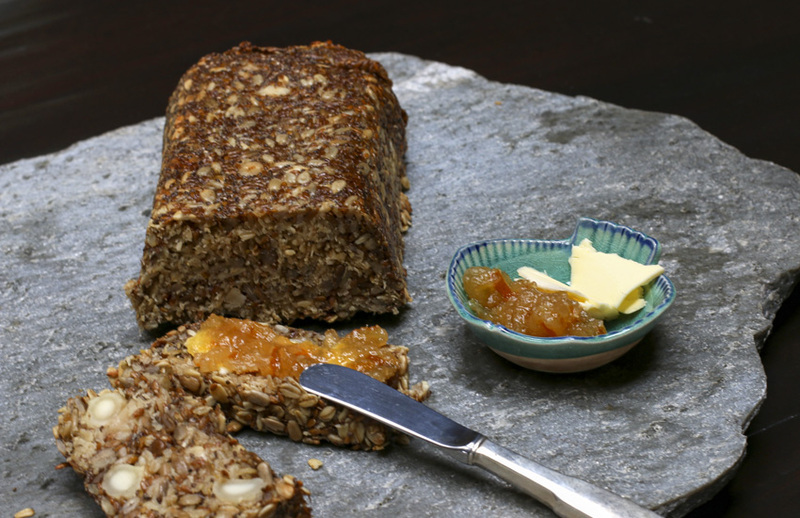 If you make this bread please send us your comments and tell us about your variations! Line a 8.5? x 4.5? 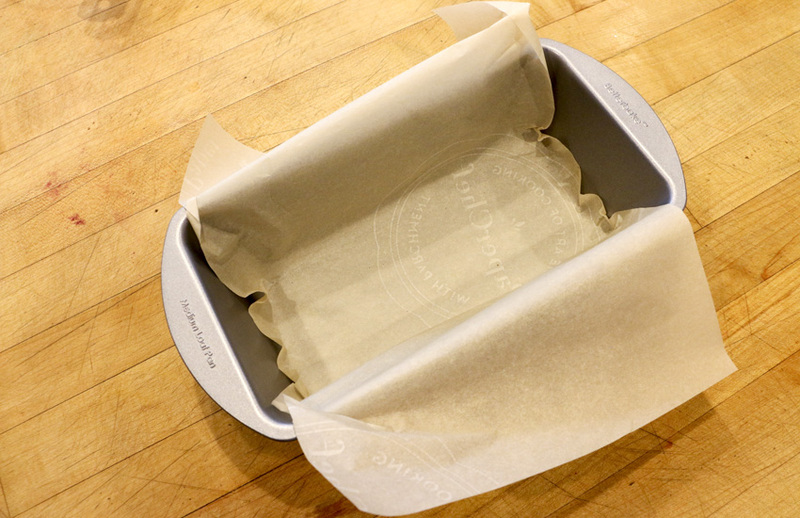 loaf pan with parchment paper. 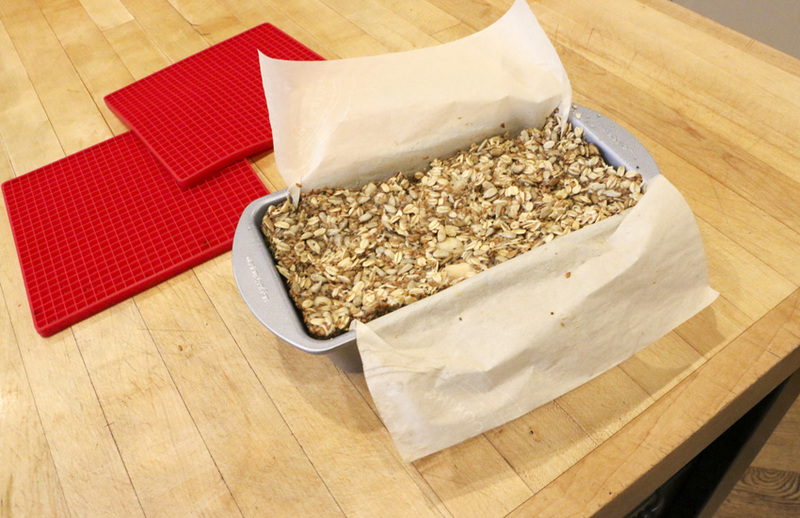 Cut the parchment paper the same length as the loaf, but extend the parchment out over the sides of the pan. See pictures above. Put all the dry ingredients into the pan and mix to combine. In a small bowl mix the maple syrup, coconut oil or ghee and the water. Pour into the loaf pan and use your hands to thoroughly combine. Smooth out the top of the loaf with your hand or the back of a spoon and set on the counter for 2 hours or as long as overnight. 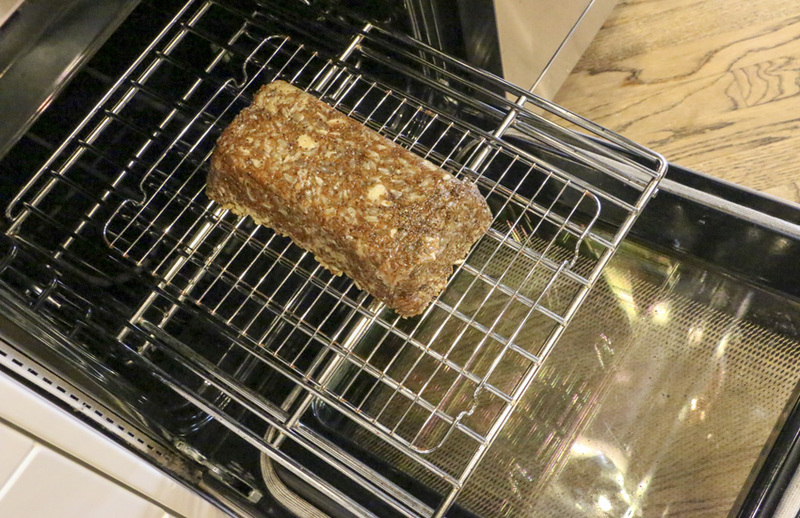 Heat the oven to 350 degrees and bake the loaf in the middle of the oven for 20 minutes. Remove the loaf from the oven and turn upside down on a cookie cooling rack. Return the loaf on the cookie rack to the oven and bake for another 30 to 40 minutes. The loaf is done when it sounds hollow when you thumb it on the side. Cool completely before slicing. Store in an airtight container or wrap tightly in foil or plastic wrap. 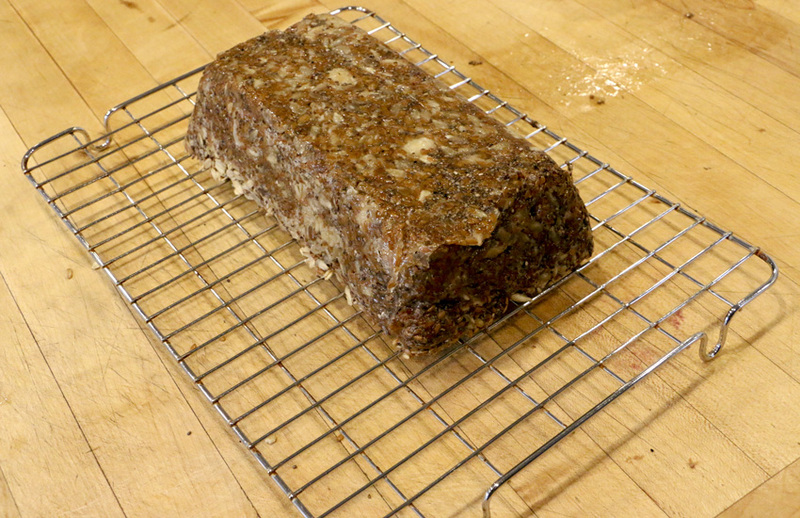 The loaf is good for up to 5 days and can be stored longer in the freezer. Slice before you freeze so you can remove one slice from the freezer at a time. As I understand it, rolled oats are gluten free. Unfortunately, rolled oats are often grown in fields or processed in factories where they may be cross contaminated with gluten-containing products. There are a few manufacturers that certify their oats as gluten-free, including Bob’s Red Mill, Glutenfreeda Foods and GF Harvest. 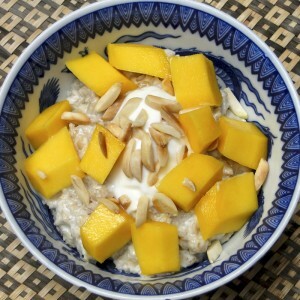 Some people with celiac disease and gluten sensitivities also cannot tolerate avenin, a protein that is in rolled oats. If you are sensitive to avenin rolled oats should also be avoided. Quinoa or buckwheat groats might work, but you would need to experiment. This recipe was developed by Sarah Britton and is posted on her site My New Roots. Amazingly, the recipe has over 1500 comments. If I were you I would read through the comments and see if anyone has found a substitute for rolled oats. Alternatively, send her your question. 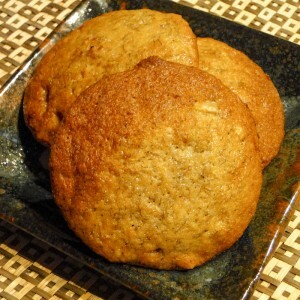 I think you will love her gluten free recipes, not to mention her beautiful photography. 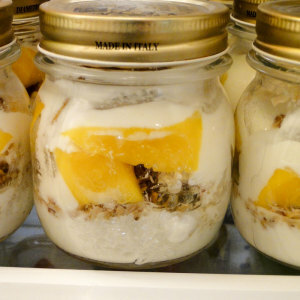 Has any one tried to make this without coconut oil or ghee? My husband hates the taste of both of these oils. He does not mind any other oil (ironically) but I cant think of another oil that is solid at room temp, so maybe they wont work? Any other thoughts? I tried it with coconut oil but he immiditaly tasted it and would not have it. Hi Asha, I have not tried other oils. If you do, please let us know how it works! I find putting it in the fridge for a day makes it possible to slice without crumbling. Any other ideas on making it easier to slice without crumbling? Nairn’s gluten free oatmeal says it is grown in a wheat free environment in Scotland. Then it is made in a gluten free dedicated building. I’ve been okay with it. This recipe IS gluten-free. Not sure why that person thinks it’s not. Oats don’t have gluten unless they are contaminated. There are other flours like chickpea flour that could possibly be used too. btw I have to order Nairns on Amazon and have it shipped to the US but for me it’s worth it. I hope I can try this recipe sometime, it sounds fun and easy. I agree Delaney, the major gluten issue with oatmeal is cross contamination. For people with true celiac, even a little gluten can be devastating. Bob’s Red Mill also makes a gluten-free oatmeal that I believe they make in a facility that does not have cross contamination potential. And yes, I love this recipe! Hi Rosemary, I do not know the answer to this question. If you try it please write back and let us know. It is an interesting solution.